Photocopiers and printers still have their place in the modern office. If you're setting up a new small office, it's important to choose a printer that will handle the daily demands of your business. A small business photocopier should be stacked with features to help make your life easier. You'll find a great range of photocopiers out there with features dedicated to improving office workflow. Some models deliver phenomenal printing speeds while others can reproduce photos with stunning clarity. The latest models even have security features to prevent cyber attacks that target sensitive customer information from your documents. With so many options out there it can be hard to choose the perfect small business photocopier that ticks all the boxes. Every industry has its own demands and requirements for a small business photocopier. Each industry is different. 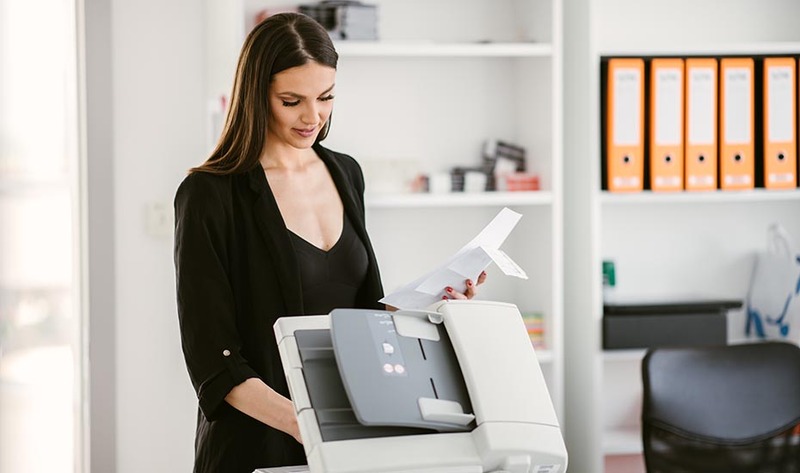 To help you pick the perfect office photocopier, we've created an easy-to-follow guide listing all the key features you need to look out for. Get expert advice on choosing the right small business photocopier. Ask the team from Copysonic today. Accounting and bookkeeping firms typically rely on central office databases to store documents. There's no need to print out a hard copy of every document. Most commonly, documents that may require hard copies include contracts, legal notices, accounts receivable notices, and cheques. Consider investing in a model that prioritises speed such as a multi-function laser printer. You'll need a printer with a high printing speed to produce large contracts faster. Cybersecurity should also be considered for the sensitive client information being printed in your documents. Ensure your printer has security features installed to protect your documents from cyber attacks. Hospitality businesses require fast and convenient solutions when it comes to printing. Technology that's simple and easy to use will help to free up your staff to focus on customer service. Printing, scanning and faxing invoices should be a breeze for your hospitality business. The same goes for rosters and contracts. It's documents like these which require a multi-function printer with an emphasis on printing speed and scanning rather than producing photo-quality prints. Does your business produce its own labels and advertising materials with imagery? If this is the case, then you'll need a small business photocopier capable of producing imagery at a high resolution. Working as a realtor, you spend a lot of time managing and reviewing contracts. You need a reliable solution for printing, sending, receiving, and scanning documents. Small business photocopiers are a solution that strikes the perfect balance between efficiency and usability. With the right model and document management software, you'll find it easy to scan and organise documents into your office database. When you're sending documents to clients or other realtors, you need a fast and reliable scanner that can efficiently scan your documents and email them straight away. As you're constantly on the road you don't always have access to office facilities. That's why it's so important to choose a multi-function printer that can communicate with your mobile and smart devices. Scan, send and receive documents from anywhere by connecting to your printer via a smart device app. For any education or training organisation, it's important to stay up to date with the latest policies and curriculum standards. That's why you need a reliable small business photocopier to efficiently produce tests, exams, newsletters, and forms. Your multifunction printer should have features that enable smart connectivity. It's very common to find models that can communicate wirelessly with smart devices and PCs. Imagine the convenience of queuing up a printing job and having test papers printed and ready to hand out before you arrive at the office. Seeing as you're printing large quantities of newsletters, test papers and resources, it's important to choose a model designed for efficiency. You want a multifunction printer that can produce large quantities of documents in a relatively short amount of time. Whether you're a graphic designer or photographer, you need a reliable printer that will reproduce your imagery with stunning detail. It's best to look for a model that makes image quality a top priority. You'll find a great range of printers from leading manufacturers that are designed to produce photo-quality imagery. When you purchase a new printer for producing photos and artwork, it's also vital to use the manufacturer's ink recommendation. Using refilled and alternative brand ink cartridges can jeopardise your printer's image quality. For the artist that's always on the go, it's wise to choose a printer with smart connectivity features. Having the ability to print hundreds of photographic images outside of your office can save you valuable production time. Ask a printing expert from Copysonic to find the perfect small business photocopier for your office needs.